I’d always wanted to see whales. I wouldn’t exactly call it a bucket list (it’s more of an idea list to choose from) but whale watching had been on that long list for quite some time. Four years ago we were at Maui airport, Hawaii, on a gorgeous day, very early for our departing flight. The airport customer service staff consisted of only a few people handling most of the tasks and they were extremely friendly, chatting away with us since it wasn’t busy yet. We checked in and afterwards we went outside to pass the time before going through security control. Did I mention the airport is located at a beautiful, high spot with a view overlooking the coastline? We were sitting in the sun outside, soaking in the warmth, when suddenly some of the staff members came over to us very excitedly. They told us they had just spotted some whales and they placed some coins in the public telescope next to us. Obviously, this wasn’t the first time Maui’s airport staff had been whale-spotting while on the job! They guided our eyes toward the right splashes in the sea and told us what to look for: a migrating female with its calf. With the airport staff’s very helpful guidance, we managed to just see them; granted, the view was from afar, but it was still a pretty awesome moment. Surreal, even. I am whale-watching at an airport! Maui airport must be among the most pleasant airports you could possibly imagine traveling through. (What a great work place it must be!) As for whales, I still felt like I needed to see them up close and didn’t cross them off my list quite yet. Four years later we were traveling in Argentina. 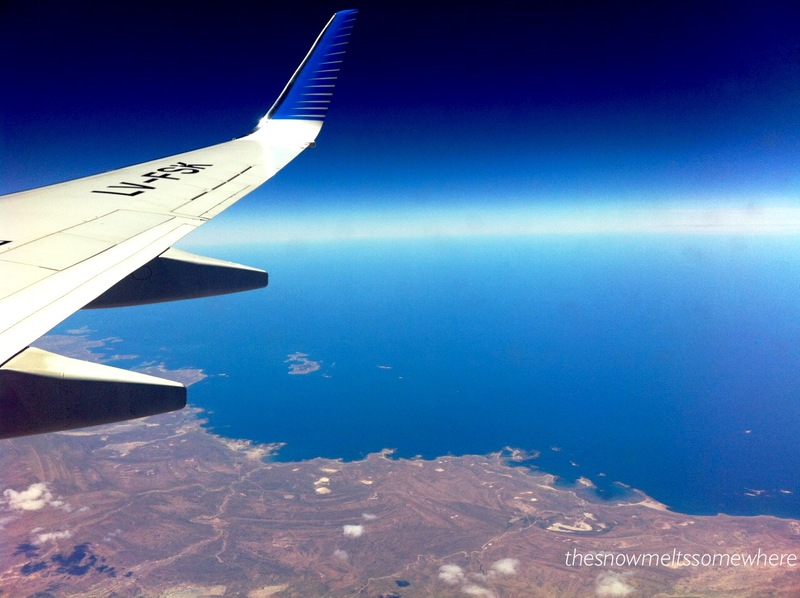 We had just spent a week in El Calafate and flown to Trelew to spend a day visiting the dinosaur museum. 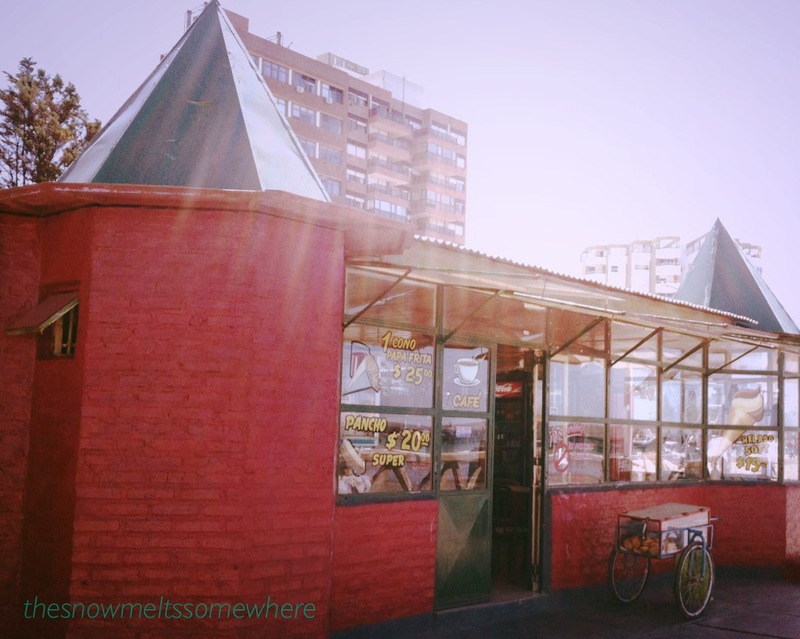 Trelew gave us a glimpse of normal life in Argentina; an ordinary, small town in the middle of Patagonian vastness. Patagonia has an interesting Welsh history and this was apparent in the region. From Trelew we took a short bus ride to Puerto Madryn, where we stayed for a few more days. Puerto Madryn was a small beach town with a rather laid-back atmosphere. We had a memorable lamb meal there at a trendy little restaurant and the price was ridiculously low for a meal that was one of the best I had during the entire trip. The lamb itself was Patagonian, but the soft drinks, fresh produce, napkins etc. must have been flown in from one of the big cities. It’s weird to think of all the consumption products shipped daily or weekly to small, isolated towns like Puerto Madryn, Patagonia, from who knows where. I mean, we were in the middle of the steppe and you could buy pretty much anything there. All the latest trends in clothing, the major brands, and so on. Even our hotel room’s wifi connection was free and quite fast. You don’t really realize how huge Patagonia is until you fly over it by plane a few times (in a window seat). I read that Antoine de Saint-Exupéry, author of The Little Prince, worked as a commercial pilot in Patagonia for some time and the scenery he became familiar with during his flights inspired the planet in Le Petit Prince. After visiting Patagonia, I can see the connection. I put a couple of his other works, Night Flight and Wind, Sand and Stars on my reading list. 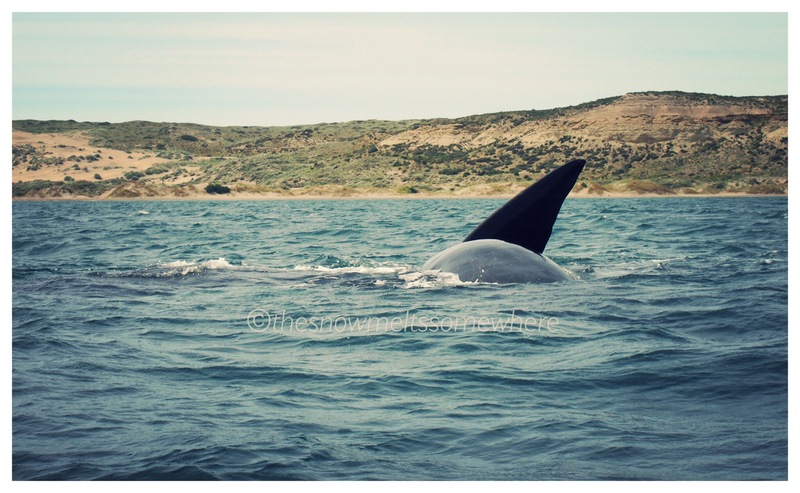 One of our goals during this trip was to see some wildlife and visit Península Valdés, a nature reserve not far from Puerto Madryn, also a Unesco World Heritage Site. We took a whale-watching tour from Puerto Pirámides – a huge, inflatable boat with about 40 passengers onboard. The crew had to search around for a while but finally located a female whale and its calf. The female was teaching the baby whale to surface and to breathe and they didn’t seem to mind our presence much, as they stayed next to us for about 40 minutes diving and surfacing. The experience was well worth waiting for. There’s something hypnotizing about these magnificent, graceful creatures. They swam under our boat but hardly made any waves, moving in a calm and deliberate, controlled manner. Beforehand, I had been slightly worried about the possibility of the whales tipping our boat over if they swam underneath us (yes, I always worry about everything!) but while we were there, I didn’t even remember to worry – the thought never crossed my mind as I was just too enchanted watching the whales. The full grown whale was enormous and the calf was pretty huge too. I didn’t get any iconic pictures of the tail poised above the surface but I did get to witness that scene and the image is stored in my memory. I got a few close up shots of the adult blowing air out of her blowhole, spraying me, my camera and the other passengers with sea water. 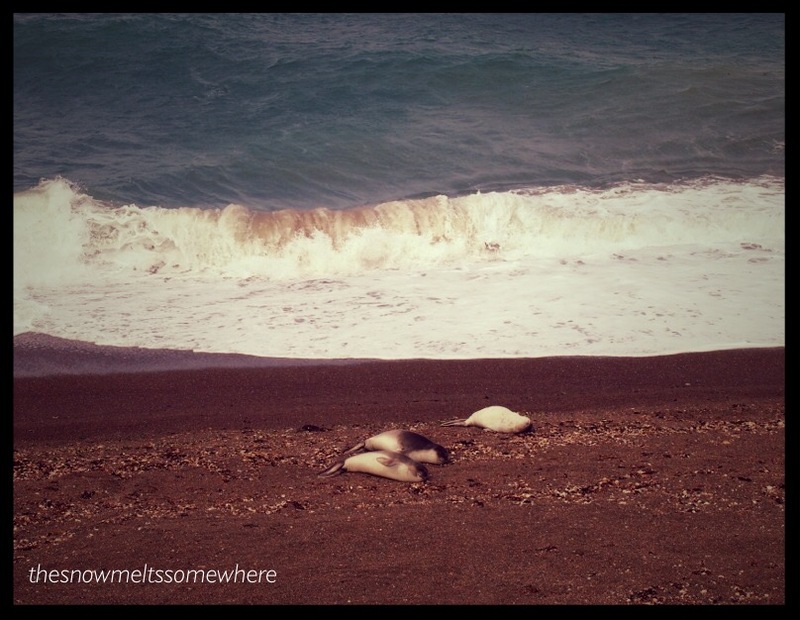 Back on land, we saw sea lions, elephant seals and penguins – all of course in their natural habitats. As for the penguins, I had already fallen in love with them at Isla Martillo, off the coast of Tierra del Fuego earlier on this trip, and was very excited to see more of them. It was incredibly windy at Península Valdés but the location made for better photos of the penguins than the grey pebbled beach of Isla Martillo. The penguins were just so adorable and I couldn’t stop smiling like an idiot for the rest of the day (or anytime I look at the photos afterwards). The penguins were unafraid, which is probably not good for them, and they were curious; they also didn’t mind posing for photos. They’d come close and stand still, sometimes tilting their heads looking like they were examining us as much as we were examining them. I really wanted to stay there forever or take a couple of them home with me – I’m pretty sure everyone who visits these penguins gets the same impulse! For me, Península Valdés was one of the highlights of our trip to Argentina and I’d recommend it to anyone traveling in that direction! You might have to book a tour to get to Península Valdés from Puerto Madryn, but the prices were pretty reasonable. We managed to get a local guide who spoke perfect English due to Scottish ancestors. The guide was there only for the bus ride so the tour was pretty independent anyway, luckily. I don’t know how it would work if you rented a car and did all this by yourself, since Península Valdés is huge and finding the right spots might be difficult (or not?). 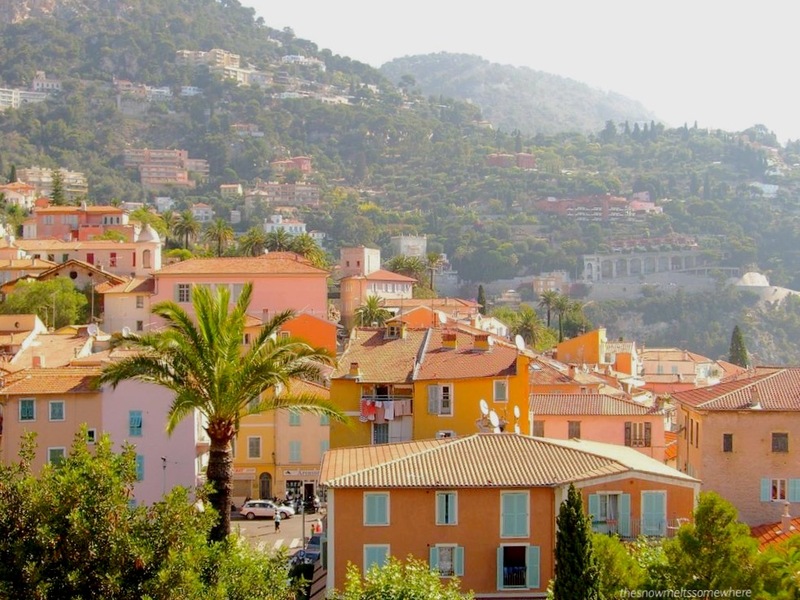 In any case, taking a tour was an easy option, although we normally don’t like being “tourists on tours” but would rather do things on our own. The only negative was that it would have been nice to spend a bit longer with the sea lions and elephant seals, which we didn’t get to decide as part of a tour group. Orcas are occasionally viewed but we didn’t see any. The boat ride was professionally organized, with life vests and English-speaking local crew giving clear instructions. Bring warm clothes for windy weather – and sunglasses, obviously. Check out the whale spotting season beforehand. From Puerto Madryn, we took a night bus onwards to Bariloche. Excellent experience, I recommend night buses! Super comfortable and they even served you dinner and breakfast on the bus! And the views were amazing. We bought our tickets at the bus station a couple of days in advance. This was during low/shoulder season. It might be hard to buy the tickets from the bus terminal’s counter if you don’t speak any Spanish (but surely not impossible since my Spanish isn’t great and I managed it). Lots of people have locks on their backpacks when traveling with night buses – might be a good idea. A really interesting post and the photographs are beautiful. You’re so fortunate to have visited all those places and experienced the amazing sealife down there. I envy you the whale spotting! I was also intrigued by the idea of Welsh connections in Patagonia. I’ve never come across that before. Funny enough, I saw whales as I flew into the airport in Kauai – it is right on the ocean, and they were underneath us as we landed. Quite the welcome to the state! I saw some from a helicopter later in the trip – apparently, they are viewable from all sorts of aircraft! Península Valdés sounds like a great adventure! I would love to go there. You got great pictures from the trip:) I love seeing whales, and the penguins are just adorable! 🙂 Great post. Thanks! 🙂 I just pretty much snapped away with my camera, trying to remember to also live in the moment! Sometimes you miss the actual moment if you just take photos, that happens to me a lot! Anyway, there’s so much to see over there, and also elsewhere in the world. If only there was more time (and money!) to travel and do what you want! You are so lucky to see such an amazing place. Absolutely love the pictures! The penguins are so cute!! Thanks! I have lots of unpublished penguin shots waiting, maybe one day I’ll post them 🙂 They were just too adorable! I really recommend this destination for wildlife spotting, though there are lots of other interesting places in Patagonia to view animals and nature as well! During our 7 week trip we didn’t even have time to see it all! I heard Patagonia is a beautiful spot, and your post tells the same story. I hope I’ll get to see it one day. I’m sure I’d enjoy it a lot. 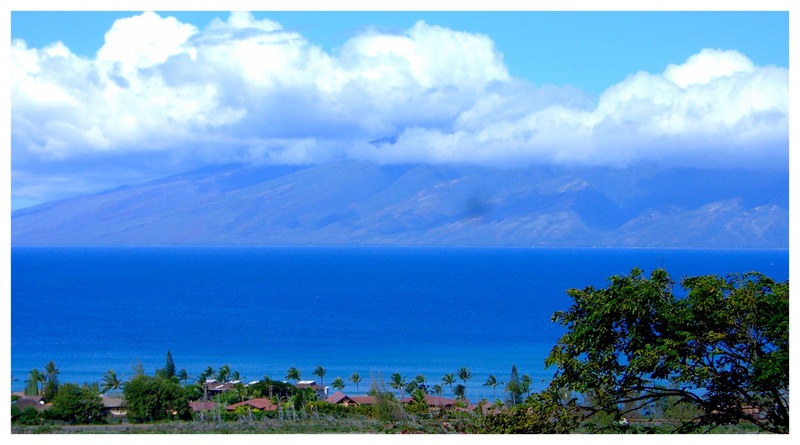 Watching the whales in Maui is one of my favorite things to do. I’m lucky to head over there every now and then but most of the time either in the beginning when only a few are already in or at the end of whale season when the last ones are departing… But so far I’ve always saw at least one 🙂 And it’s mesmerizing! I heard that Peninsula Valdés must be incredible too. Lucky you for getting to go back to Maui! 🙂 I adored Maui. I was super thrilled to see whales in Argentina, it had been a dream of mine for so long! They’re amazing, aren’t they? 🙂 Thanks for commenting! Thanks to you for joining me 🙂 Virtual trips are almost as good as the real ones! That’s something I’ve noticed while blogging! Thank you, so sweet of you 😉 It was such a highlight for me, seeing those whales. Happy that I could share the experience, if only just thru a blog post! So don’t know if you had more encounters with the wales . I’ve been to the Azores Islands recently (and unfortunately could not go whale-watching then 😦 ) but you might want to take a look here and who knows add it to your wish list :). That’s annoying! The whale season was just ending in Paragonia so we were lucky. Yeah. It was a bit of a gamble with the tour money but if we did come across a pod it would have been amazing! Whales are magnificent creatures. So majestic. I have only seen them in the distance, so your experience sounds extra special. It certainly looks that way from the photos. Patagonia is relatively unknown to many. My former boss now works in the region as a tour guide. She loves it! Working as a tour guide sounds like fun!! Wouldn’t mind doing that myself – though in Patagonia you’d probably need outdoors skills, which I don’t really have! 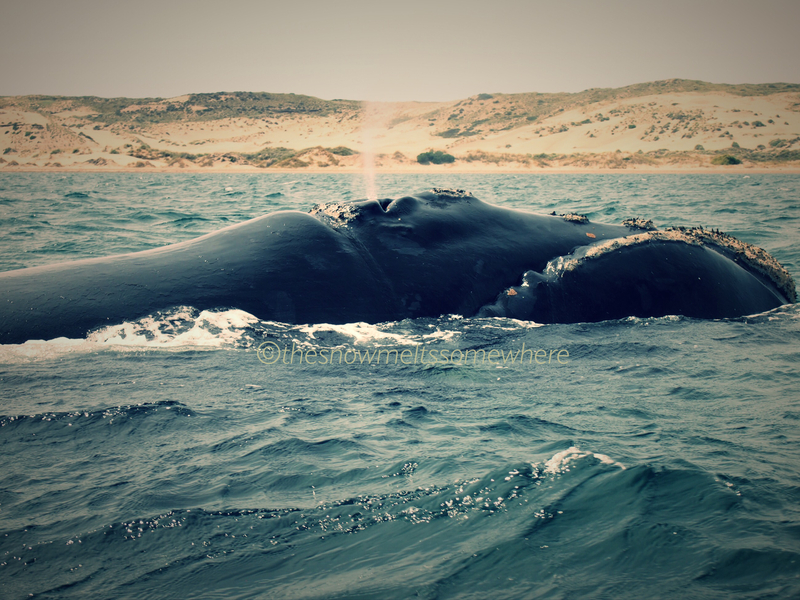 Whalewatching, at least, was easy, hahah! Thanks for dropping by, Amanda! The pleasure was all mine, tSMS – hope you are having a lovely weekend. Hope you have a lovely weekend, too! That is pretty darn cool! Whale spotting at an airport! Patagonia sounds like an amazing place full of incredible natural beauty. I just feel all warm and fuzzy looking at the penguin pic!! Thanks for the kind thoughts and warming words! 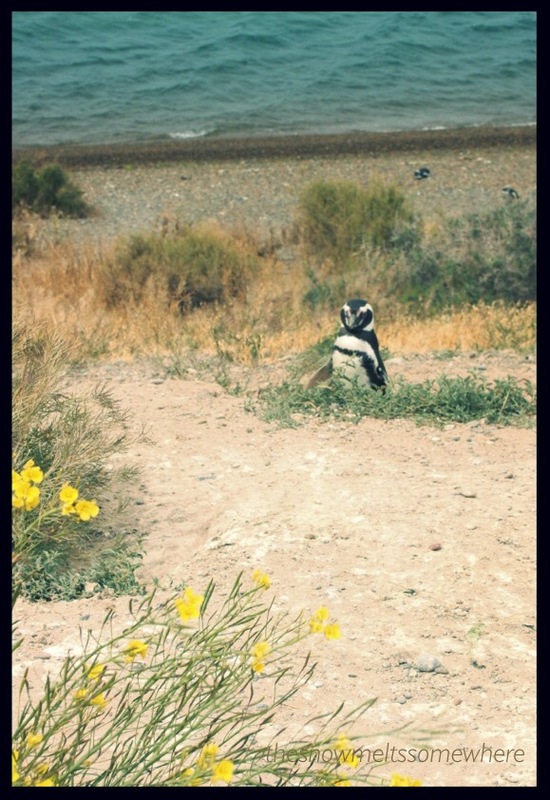 Patagonia was all that… and those penguins were just so adorable!